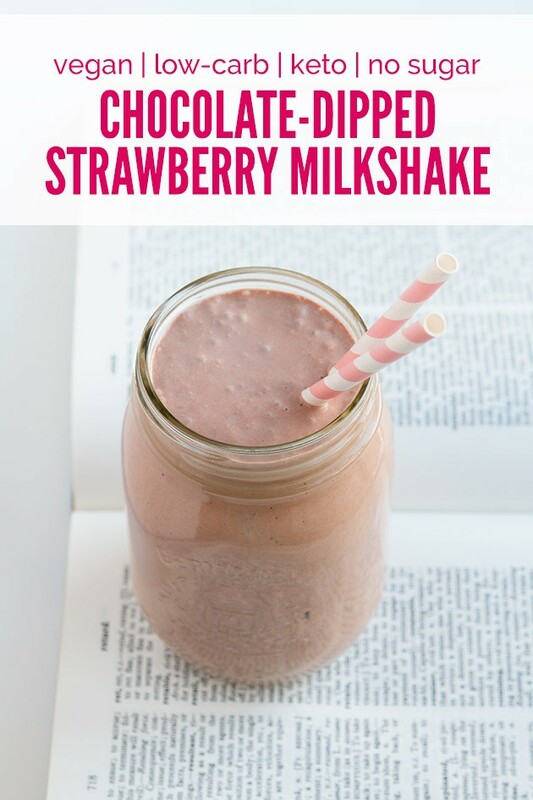 A low-carb, keto, vegan milkshake recipe made with frozen strawberries and coconut milk, blended with Genuine Health fermented vegan proteins+. Completely dairy-free, sugar-free, and keto. I have another keto snack recipe for you today! 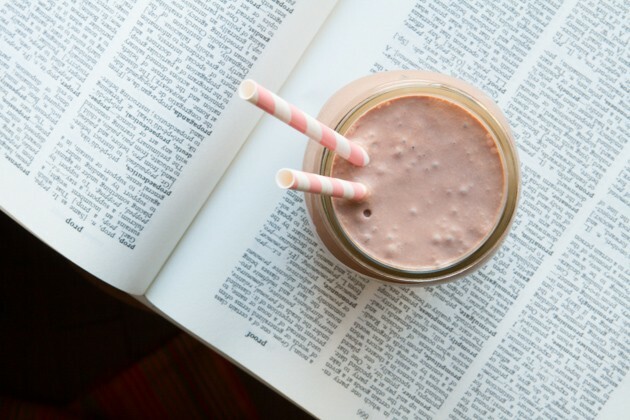 This keto milkshake has just 4 keto ingredients and takes only moments to whip up. Plus, you can take it with you on-the-go! And, for those interested, it also doubles as a keto ice cream recipe. More on that in the keto recipe details below. I added 2 scoops of Genuine Health fermented vegan proteins+ to this keto recipe for one reason alone, (well, maybe two). The first: to effortlessly boost our intake of fermented foods. The second: to make the keto milkshake taste even better! 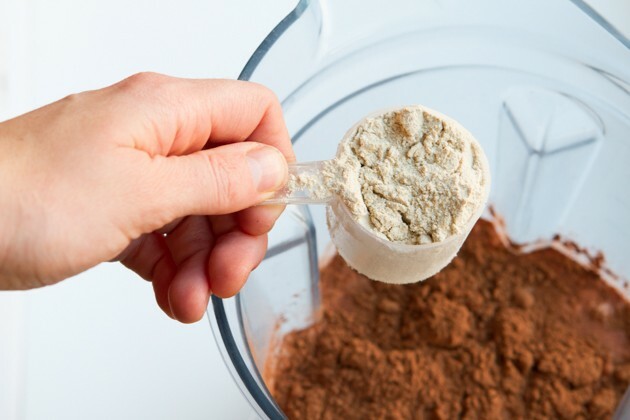 Seriously, this protein powder boosts the natural flavors of the accompanying ingredients without any chalky consistency or metallic aftertaste. The fermentation of whole foods liberates amino acids, increases protein quality, increases mineral content, and allows your body to build a flourishing microbiome in your gut to fend off infection, build strong immune defence and maintain a healthy weight. 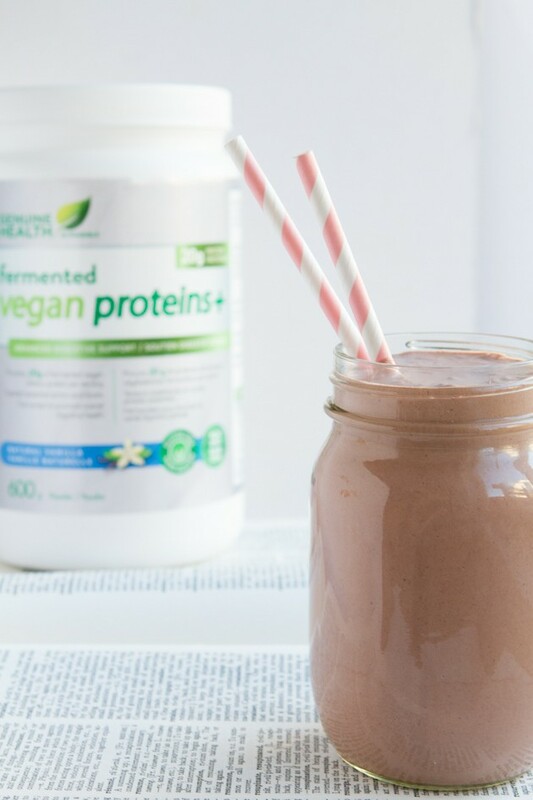 This is a completely fermented vegan protein that contains 20 grams of fermented soy-free and gluten-free protein in every serving. 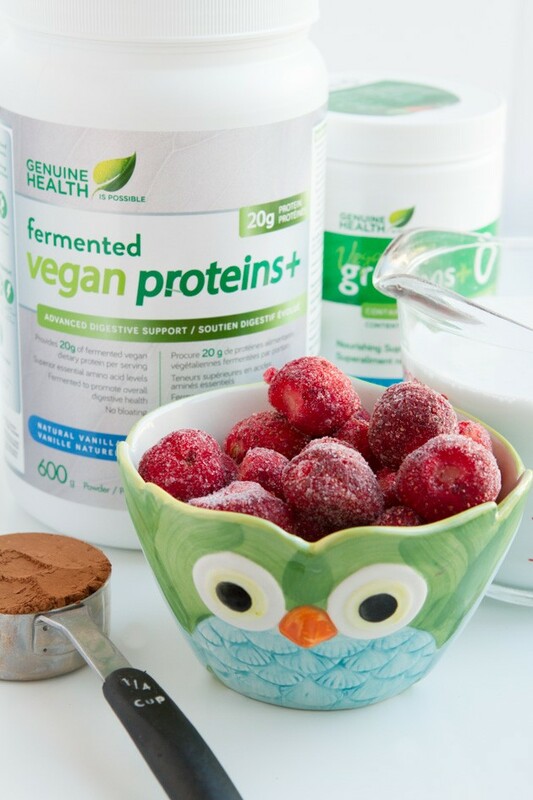 Fermenting the ingredients breaks down the plants’ protective casting, amplifying nutrient availability and facilitating complete protein absorption. Now, let’s get to the keto recipe! 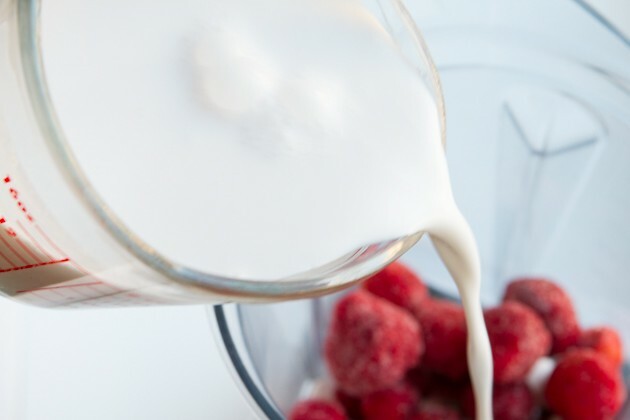 A low-carb, vegan, keto milkshake recipe made with frozen strawberries and coconut milk. Completely dairy-free and sugar-free. 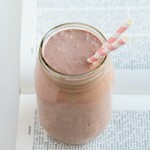 Add coconut milk, strawberries, protein powder and cacao powder to the jug of your high-powered blender. Blend on high for 1 minute, until smooth. Add the ice cubes, one at a time. Continue to blend until smooth, about 30 seconds. Divide amongst two glasses and enjoy with a friend. To make green: You could also add a scoop of Vegan greens+ O. I would have, but the color would have been horrid for photos. To make into keto ice cream: Add ¼ cup coconut oil with the coconut milk mixture. 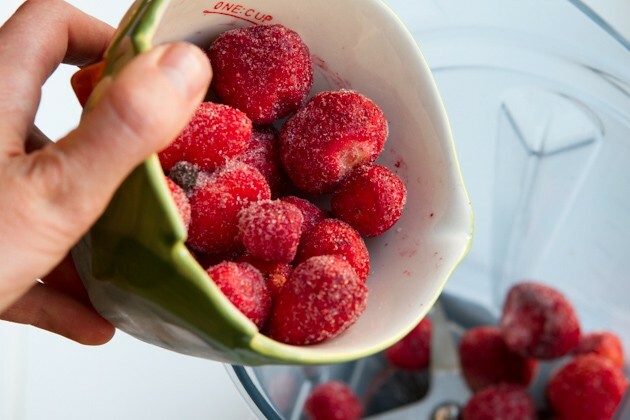 Once all of the ice has been added, pour the cold mixture into your ice cream maker and churn on high for 20-30 minutes, depending on your ice cream maker. If you do not have an ice cream maker, transfer the mixture to 9x5 loaf pan and place in the freezer. Set the timer for 30 minutes before taking out to stir. Repeat for 2-3 hours, until desired consistency is met. Serve immediately as soft-serve or scoop into a 9x5 loaf pan and freeze for 45 minutes or so. Store covered in the freezer for up to a week. You can use fresh or fresh strawberries. I chose frozen organic strawberries because they’re less expensive than fresh right now. Also, cranberries would be amazing in this keto recipe and a bit more festive! If you can’t do coconut milk, you could try cashew milk which will be a bit thicker. If that doesn’t work, use any nut or seed milk. It just won’t be as thick. Two scoops of keto-approved Genuine Health fermented vegan protein powder for good measure. Seriously, this stuff is heaven. It adds so much flavor to the dairy-free, keto milkshake. This is an everyday keto milkshake, free to enjoy at anytime, anywhere. If I using it as a carb-up item, I add sweet potato. And, if I’m keeping it low-carb, keto, I usually enjoy as a treat after dinner when I’m not doing a massive carb-up. What fruit would you add to the blend? You could make chocolate covered anything! If you don’t want to add fruit, you could do almonds, hazelnuts, anything!